Well - Ed and I went away. We relaxed, I worked on Brian's very late two year video (oh, yes I did!) and we ate a lot of good food. But mostly - I was excited to sleep. A lot. As it turns out, it was fortuitous that I got all that extra sleep. Someone was watching out for me. While we were headed back to reality, I got a message from home that Gavin developed a runny nose. We were on our way home, so I didn't panic. When we got there, Gavin seemed a bit "off," but he was still smiling and his nose really just seemed runny. I gave him a bath and we put him to bed. I sat in bed for a long time and couldn't shake a weird feeling all night. When it was 12:30am, Ed turned over and asked me if I was going to go to sleep - and I said I couldn't for some reason. Finally, close to 1am, I put my head on the pillow. I was just starting to drift when I shot up with major anxiety and felt the need to rush to Gavin's room. 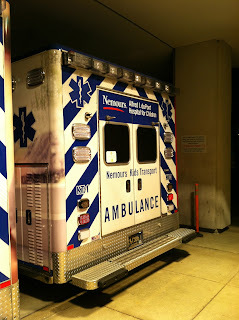 When I got there, he was lying in vomit and having difficulty breathing. I unzipped his bed and picked him up - quickly realizing he was burning up and was like a rag doll. After yelling for Ed, I brought Gavin to the bathroom and took his temperature - 103.6. He got a dose of Advil... and I also decided to try his rarely used nebulizer to see if that would help. 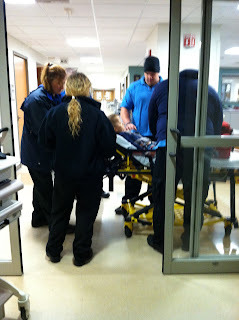 We didn't even come close to finishing the treatment before I announced that we needed to get him to the emergency room. Ed helped me pack furiously and I rushed Gavin to our local hospital. 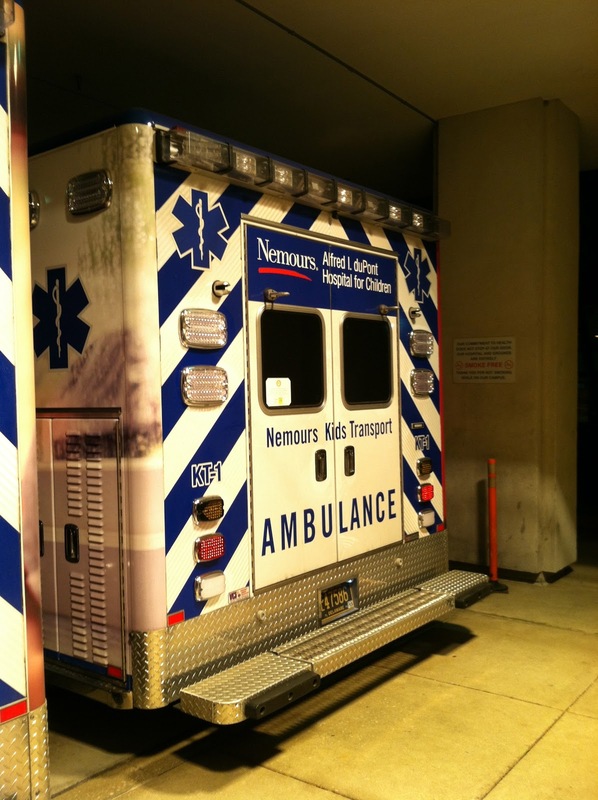 I debated for about two seconds if I should take him to DuPont - his main hospital that's an hour away - instead, but he was truly in distress. He needed help with his breathing immediately. We got to the local hospital around 1:30. They took a chest X-Ray, put an IV in (and got it in on the first try!!) and suctioned his nose to test for RSV. The RSV came back positive. We were all pretty shocked. 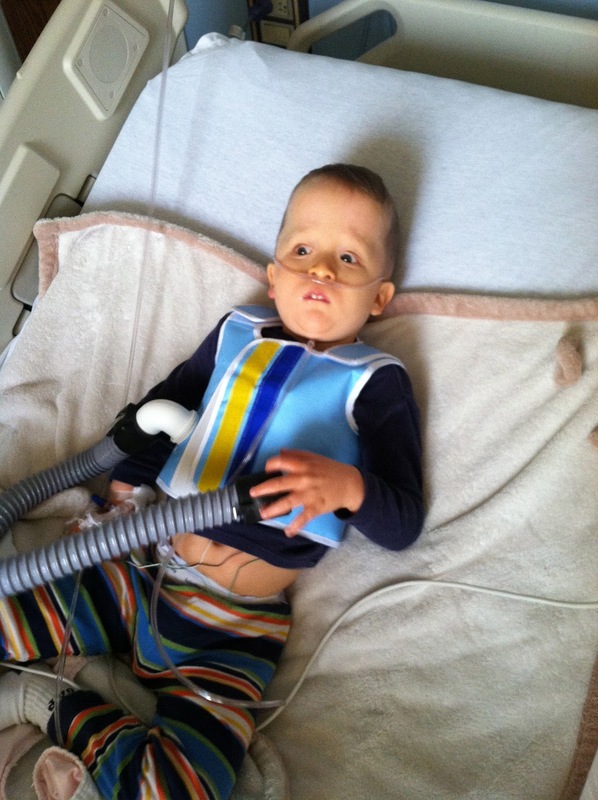 As soon as Gavin was stable on oxygen, they called for a DuPont transport team to transfer him. I had an hour before they got there and was SO grateful when his nurse said she'd bring in her paperwork and sit with Gavin while I rushed home to pack some more essentials. Like Gavin's portable DVD player with his Little Einstein movie. I'd rather leave home without my toothbrush than that - it makes him so happy. And it makes traumatic things less traumatic. We all got to DuPont at 4am~ish and were brought right up to the floor where it all began. We spent close to three months living on this floor when Gavin was an infant and had... RSV. Gavin just fell asleep - 11 hours after this all began. He's exhausted and working hard to breathe. They have him on Oxygen and are treating him with that cough assist vest that we fell in love with last time we were here. He has a pretty ugly cough - and his chest sounds very congested. There's absolutely no telling how long we'll be here. But we do have something on our side. 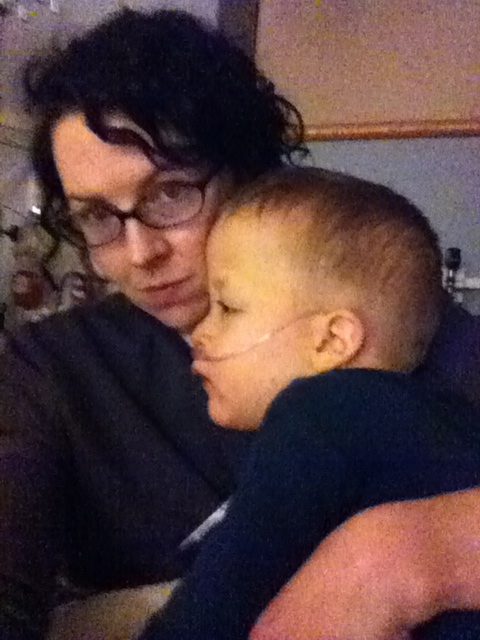 Gavin's main doctor is here and in charge of him! That doesn't always happen. Dr. Raab is not an alarmist and is pretty laid back about discharges. They just did rounds and decided - since Gavin was sleeping - to turn off his oxygen. 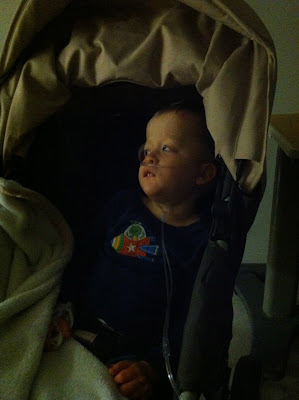 If he can stay at a certain oxygenation percentage for a few hours on his own - we may be able to go home today. But it all depends on Gavin. Say a prayer! As much as I'm worried about Gavin, I'm equally worried for Brian. He had just welcomed me home. Last night he didn't want to go to bed - he wanted a second book and then a third book and then more tickles and then another hug. He got all of that and more... and we talked about all the things we were going to do together this week. And then this morning when he woke up, Gavin and I were gone. And... he has a cold, too. Truly - it's never a dull moment at our house. Sending LOTS of love, hugs, and prayers for all of you! 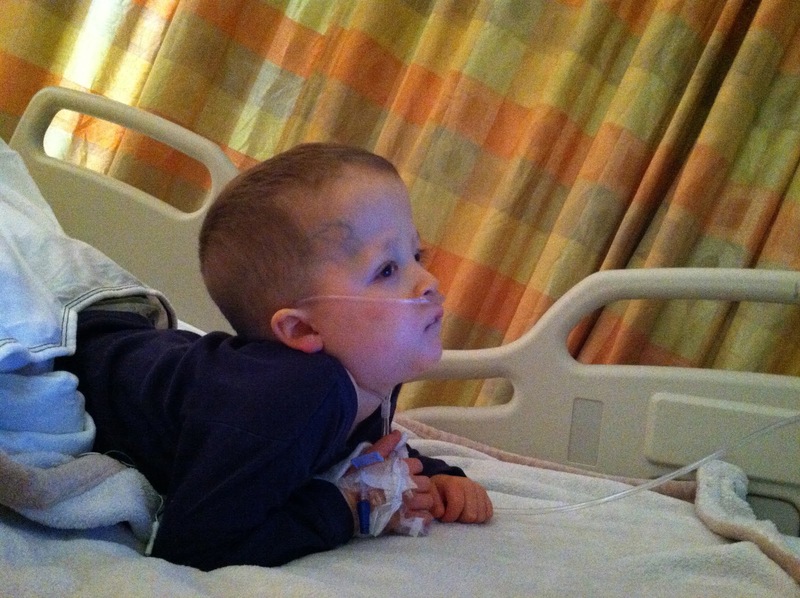 Wishing for a speedy recovery for Gavin, and a Thanksgiving spent at home! Hang in there! We are all thinking of you and your fmaily.